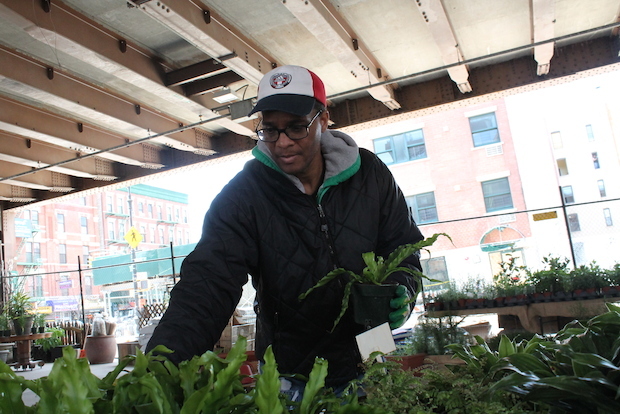 HARLEM — The smell of fresh paint and dirt wafted through Urban Garden Center's space underneath the Metro-North tracks at 116th Street and Park Avenue this week. The store has been open just a few days after being closed for three weeks following the fatal March 12 explosion that demolished two buildings and killed eight people just across the street. It seemed that everything was back to normal — but not quite. A metal beam and two pieces of wood that were blown into the space after the explosion still lay at a worker's feet. The windows of a building that were blown out in the blast remained boarded up. And then there's the vacant space where the two buildings once stood and people once lived their lives. "I still haven't gotten used to looking across the street and seeing an empty space," Urban Garden Center employee Lloyd Nathaniel said while pointing beyond the store's restored fencing at where the two buildings had stood. "It's good to be back but it still feels a little strange. The whole place is different," added Nathaniel, who was at the store on the morning of the explosion. Officials from the New York City Department of Small Business Services say 60 ground-level businesses in the area near Park Avenue and 116th Street suffered damage. Urban Garden Center was one of four that were destroyed or heavily damaged. The store has shoveled out the knee-deep debris in some spots and has re-installed rows of fresh flowers and plants, but owners are still trying to calculate their total losses. They have turned talk of insurance and payments from Con Edison over to their lawyers so they can fully focus on the difficult task of making sure the 3-year-old business survives. "We have to focus on serving our customers. We have to make it seem like it was before this horrible thing happened," said co-owner Aspasia Gatanas. The reminders are hard to forget. The greenhouse that was destroyed in the blast is being taken apart by employees as they await replacement pieces. People still stop in to gawk at the space and it's not uncommon to see workers from different government agencies in the area. It's the customers and neighbors that bring back any sense of normalcy, said co-owner Dimitri Gatanas. Standing outside the store, one man with a shopping cart walked by and looked at Gatanas and the store before shouting "Very nice! Very nice!" Seconds later, a man who gave his name only as "GQ" and who works at the nearby La Marqueta walked over. "I'm so glad you're open. People are really going to help you out," he predicted. Just then Margaret McDermott called out to Gatanas from across the street before running over to give him a hug. "When I saw that you were up and running I all but lost it," said McDermott. "I know it's going to be a better place than before." Gatanas said the business is working hard to shed its status as victim and get back to making the area underneath the tracks a viable commercial destination. "We don't want to be known forever as the place that was blown up in the explosion and neither does the neighborhood," said Gatanas. "There are people coming in to buy something just to support us. There's a lot of hugging going on." Jill Rose, 50, a self-employed entrepreneur, and Rose Strokes, 60, a volunteer, decided to stop in and try to support the store. 'When you are dished lemons you make lemonade. That's what it looks like they are doing here," Strokes said. Rose said she wasn't surprised to see the store filled with neat rows of flowers again. "New Yorkers rebound quickly," she said. "They rebound and they rebuild. That's what spring is all about." Not that Gatanas wants anyone to forget about the lives that were lost. He already has plans for a memorial for the victims, which he feels is appropriate given the proximity to the buildings. To acknowledge the financial support he received from the public when the store was closed he plans to sponsor local community and school gardens in East Harlem. Looking at the steel beam that flew into the store from the explosion, Gatanas noted that it had a series of openings that would serve well as planters. "We lost so many lives and we are still sad but we have to try to pick up the pieces," he said.